Notes: From the Editor-in-Chief: The R1 DVD release, apparently, tells the story in reverse order, with Episode IV being shown first. Well, whatever. The Earth is being invaded (again)! The alien forces bent on conquering Earth, possess frightening, destructive bioweapons (wake me up when the alien invaders possess non-confrontational, fuzzy animals), and keep careful record of their accounting expenses. 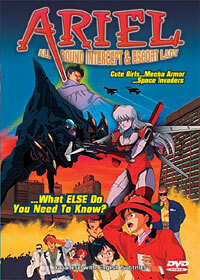 Fortunately, the genius Dr. Kishida has built ARIEL, the ultimate in ferocious feminine fighting fury. Unfortunately, the pilots he has chosen are his granddaughters -- and are unwilling to pilot the giant mecha. Kazumi would rather be a normal, tennis-playing high schooler. Aya would rather be studying for her college entrance exams. And Miya is still ticked off at her grandfather for always interfering in her personal life. Is Earth doomed? Do I care? The biggest problem with ARIEL, I think, is that it really has no freaking clue what it's trying to do. Is it trying to be a mecha drama? A war epic? Comedy? Good? Only the producers know, and they're apparently not telling, not if ARIEL is any indication of their intentions. Everything about this title is sub-par. The average, yawn-inducing animation is nothing to write home about, or to even mention to your roommate over breakfast. The simplistic art features some of the worst mecha designs this side of MAPS. The enemy machines have a campy Godzilla feel to them (I kept expecting Ultraman to show up), and ARIEL itself does little more than elicit giggles from the viewer (suited-up it looks like a transvestite Valkyrie, unarmored it looks like a 50-foot tall Barbie doll, complete with facial expressions and brushable hair). All the while, the viewer gets subjected to a bad 70's soundtrack sure to get on your nerves after the first couple of repetitions (and there's plenty more where that came from). I wish I could say that the plot helps save the title from its inferior technical base, but it doesn't. The title initially introduces a slew of different characters, both good and bad, and then tries to develop every single one of them as if they were each the main character. As a result, no one really gets developed satisfactorily at all, and the story ends up resembling a badly run round-robin writing exercise than a coherent story. There is no sense of completion at the end, only a vague disquiet in the viewer's intestines. There are worse anime titles out there than ARIEL, but that's like saying that there are worse things than losing a finger in a wood shop accident. Let the buyer (or renter, hopefully) beware. Recommended Audience: Some rather gory deaths of the enemy force's bio-weapons can be found, but other than that, there is nothing objectionable to be found in ARIEL, besides the obvious I mean.